Are you searching for the best bedding medium for your barn stalls, or outside paddocks? Do you want to avoid the constant and often challenging battle to keep ahead of the mess and odour problems associated with stabling, or the mud in the paddock? 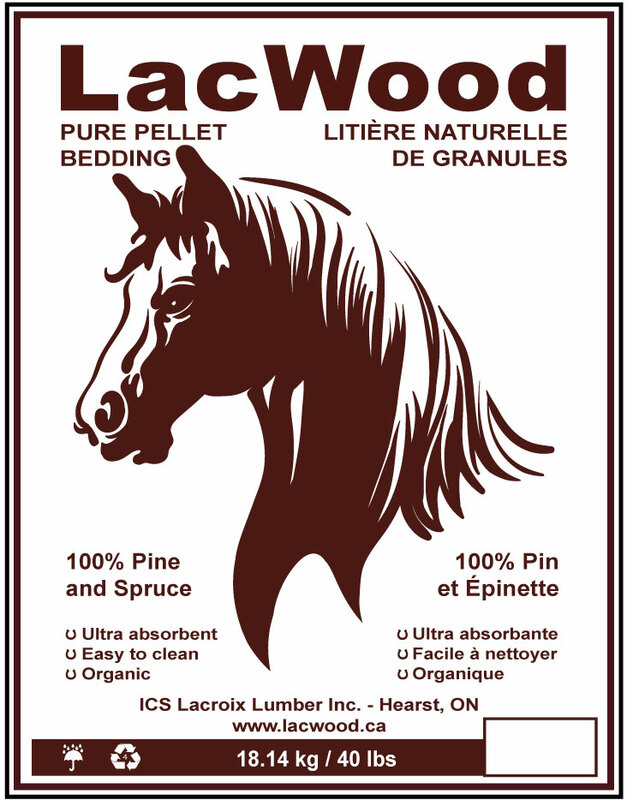 LacWood’s Premium Horse Bedding Pellets are made only from pure softwood fibres; a natural, organic product, safe for horses and the environment. Our pellets are the cheaper, safer, and most efficient way of caring for your horses needs. When compared with wood shavings, LacWood’s Bedding Pellets are known to be 9x more absorbent, last longer and reduce storage space by up to 75%…a little really does go a long way! In general, using LacWood’s Horse Bedding Pellets instead of shavings or straw will help reduce labour costs for maintenance and disposal as well as providing a safe and comfortable environment for your horse. Using LacWood’s Horse Bedding Pellets will brighten the stall, provide a pleasant pine aroma, and create a comfortable, shock-absorbing environment for your horse. Bedding pellets are light in colour, highly absorbent, inedible, and very low in dust. Can be used in horse boxes and trailers to absorb moisture during transit. Produced from northern pines and spruce. No sawdust or shavings from chemically treated urban trees or milled lumber will ever be found in our product. Free from oils, tars, acids and resins that can cause illness or irritation, because pellets are processed at such a high heat. Absorbs moisture (water/urine/ammonia), sticks to manure (similar to cat litter) and helps keep your stable cleaner,dryer,longer. Up to 50% savings due to reduction in bedding product required when using wood pellets. Sifts easily, with only the moisture-laden clumps tossed out. Quicker, easier clean-up reduces workload, resulting in lower labour and costs and more quality time to spend with your horse. The need to strip the stall will go from being done weekly to every couple of months after converting to our organic wood pellets. Use 1/3 or less storage space than shavings. LacWood’s Premium Horse Bedding Pellets are packaged in 40 lb bags on skids, weather and waterproofed and shipped by truck from our facility in Northern Ontario. Each skid carries between 50-75 bags. Bulk bags are also available. Download your own copy of How to Store Your New LacWood Pellets.